Great Pretenders Cigars - Buy Premium Cigars Online From 2 Guys Cigars . Introducing THE GREAT PRETENDERS Measuring in at 6 inches with a hefty 54 ring gauge and available in 3 blends, THE GREAT PRETENDERS are long filled Premium Cigars available in 5 packs and ready to go. The story of THE GREAT PRETENDERS came many years ago when hearing customers searching for cigars that taste like others for a lot less in price. This was not easy to do, but it is finally done. These are deliberate copies of the best-selling Premium cigars in the United States who must go unnamed, as they are not those brands but THE GREAT PRETENDERS. So what should you expect from THE GREAT PRETENDERS? First and foremost is VALUE. Any 5 pack of either of the 3 blends are just $19.99 (That’s just $3.99 per cigar). Speaking of the blends, first you have the Smooth & Creamy which indicates a graceful blend of subtleties found in some of the top selling Connecticut Shade cigars on the market. Next you have the Bold & Spicy which is the Sun Grown Habano blend and finishing off with the Dark & Rich which incorporated well aged Maduro wrappers over a rich and rewarding blend. No band, no box, all the money goes into the tobacco and the cigars for the best pricing possible. 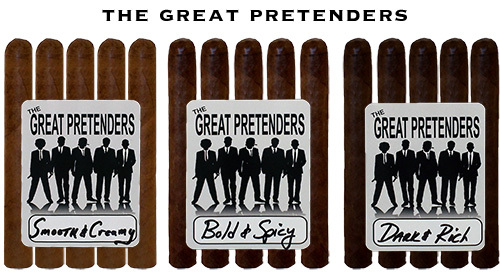 THE GREAT PRETENDERS are amazing cigars for a fraction of the price of the original brands with the big names on them… yes, they are THE GREAT PRETENDERS.